In front of us lies an impressive looking box filled with high quality components - obviously this is true Ravensburger style. And someone didn't really have to bother about the production cost of the game either - no wonder: it's a marketing game of Siemens Business Services about finding "e- and m-business cards" as Siemens puts it. Well, marketing games do not have the best reputation in terms of game design and the game designer (or rather design team) "Funtasy Factory" only comes to mind for their not so well received card game "Der Schuh des Manitu" - a merchandising product for the hilarious, and very successful, German film of the same title. This in mind we studied the rule book with mixed feelings and learnt that each player represents an expedition team in the deep jungle near the Anaconda Valley and that their goal is to collect two mysterious, golden "future stones", the jokers (referring to the stones, not the design team). Rather surprisingly, the Anaconda Valley depicted on the board is "off limits" and cannot be entered but our search for some logic in this story was going to be challenged even more. Unfortunately, the expeditions have lost all but one item of their high-tech equipment that will successfully guide them through the valley and help them in case of emergencies in this adverse environment. 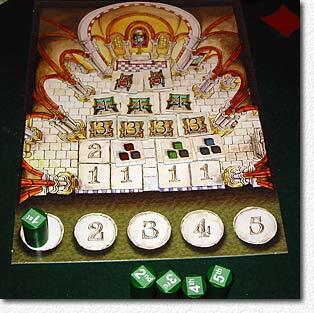 Luckily, the game designers created a set of rules that allow expeditions to regain pieces of equipment: each of the lost items as well as the joker is located in one of the seven Maya temples placed on the board. And there is a card deck holding each item twice and its top card tells the players the item to search for next. 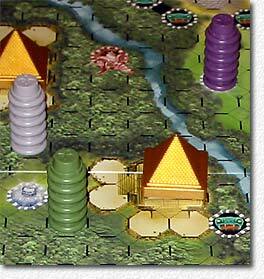 To make things easy each player is allowed to look at the content of three of the seven temples before the game commences. So, off the players go to search for the item, those who already know the correct temple (and still remember it) rushing into its general direction. The motor for the movement turns are cards showing a number of movement points that must be spent completely and usually 2 directions an expedition may move into and each player has a hand of 7 movement cards. Some cards allow movement in all four directions (diagonal movement is never permitted) or allow rolling one or two dice to determine the number of movement points. 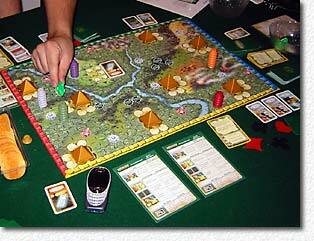 In addition there are teleport fields on the board that enable players to travel long distances in one turn. Some of the movement cards carry a symbol indication that the expedition has encountered an additional challenge described on an event cards to be drawn. The challenges all require the usage of 2 of the high-tech items in order to be completed successfully. For example, one of your expedition team members suffers from diarrhoea and you need your "analysis device" to search for the cause and call a doctor with your "cell phone" to ask for a cure. If you have both items you get the advantage of regaining energy points or the like, if you only own one of the items you can still ask another player who has the item to use it for you, usually providing a benefit for both players. Only if you don't have either of the items needed do you have to perform an action which helps the other players or hinders all (like changing the position of two temples). Tactically, it doesn't make a lot of sense to chase for items whose temple position you don't know since you are running the risk of finding the wrong item and loosing energy points as a consequence. And the challenges described on the event cards aren't really a problem, even if you do not own any of the items asked for. This of course is not true the joker item. As with any other item there are also only two such joker cards in the game. And to win the game a player must possess both joker stones! Inevitably, each player will rush to the temple holding the joker once this card is at the top of the item deck. Those who know the correct location will do this on a more or less straight path; the others are left with the task to determine where everybody else is rushing to. Once the second joker has been collected there is no real need anymore to collect the remaining items as the endgame now begins (the designers luckily became aware of this and split the item card deck in two parts to be played in sequence - each part holding one "joker" card). We found that the endgame is rather broken. Most of the time two players possess one "joker" each, finding themselves in the position to hunt down each other to acquire both. Leaving the other players aside, this task in its own is quite ridiculous. To get the stone from the other player one has to attack that player by moving on the same space the player currently is on. This may take a while due to the movement cards and the requirement that you spend all your movement points on the card. But once this has been achieved the odds of the attacker to win the fight are only 25% making it very unattractive to attack someone in the first place. The looser of a fight has to relinquish the joker stone to the other player (or any other item if he doesn't possess the stone). How on earth this game can be completed within 45 minutes without players giving up by just attacking the other stone-carrier and most likely loosing their own stone that way is beyond me. Anyway, Günther and I, both carrying a stone came to the conclusion that to end the game it is required to fight and, hence moved towards each other. Eventually, Günther was in the position to attack and to no ones surprise lost his stone to me. On my next turn I performed what should have been my winning move by moving onto the "Anaconda Valley Exit" field. Here the last and final challenge is waiting: a randomly drawn card shows three items and asks for the identification of the corresponding Maya temples. While I was absolutely sure about two of the temples I had some doubts about the last item. Walter pointed me towards the temple he thought was correct (just to end the game I guess) and I chose that one - only to find that it was the wrong one! As a consequence I lost both stones which were placed on the base camp fields and my expedition was moved away far enough to have no chance of regaining them in the next moves. Thomas and Günther grabbed one stone each in their next turn and Moritz performed what I would call the best Anaconda tactical move possible: he moved his expedition onto the exit field ready to fight with anyone wanting to leave the board. Since he would be the defender his chances of gaining a stone was 75% - not bad. Unfortunately, in his next turn he had to move away before having been attacked by both "stone carriers" and Günther in the end won the game. Siemens terms the game quite rightly a "party game". The story behind the game is ridiculous enough to catch the first laughs. And while the game unfolds more and more flaws are discovered by the players which can only be endured if no one is willing to take the whole thing serious. 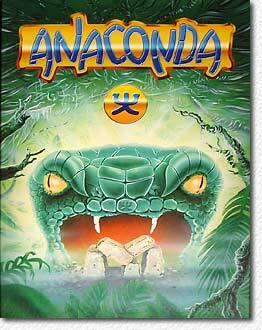 For strategy gamers Anaconda will be endless and result in a stalemate. The best tactical advice on how to win Anaconda is: stay close to the temple with the "joker" stone and ignore the other items (but remember their temple position!). And most importantly: attack the joker carriers and roll sixes. Following Keywood, Keydom and Keytown this is the fourth game of Richard Breese. 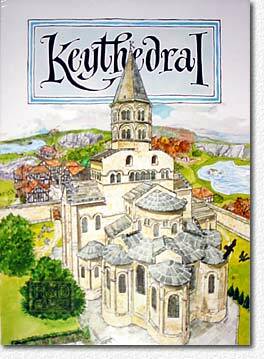 As with his earlier releases, Keythedral has been published in a rather small number of only 600 games and after the success of the earlier games it came as no surprise that Keythedral was almost sold out on the first day of publication. Luckily, Günther was able to grab a copy in Essen 2002. Keythedral comes in the same good production quality as Richard's earlier games and in fact he seems to have been listening to some quarrels about the rule books in the past as this time we find a full size booklet with clearly described rules and all the important details in a nicely structured way. 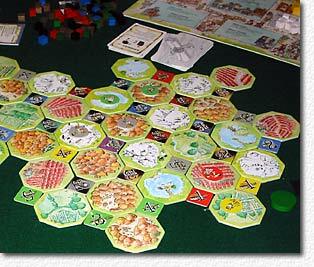 The game board this time is variable and consists of octagon shaped tiles depicting different terrain types for five different resources (timber, stone, water, crop and wine). Before the game commences four of these tiles (2 stone, 2 timber) are placed next to each other yielding a square shape. The little square shaped "hole" in the middle is where the cathedral marker is placed. In sequence each player now takes one of the facedown tiles and places it along the long side of any of the already placed tiles and as a second step places one of his five "cottage" markers at any of the available short sides of a tile. The aim here is to place your cottage in such a fashion that each of the four sides of the cottage token eventually borders a terrain tile in order to have a good choice of resource fields you can send your worker to (who lives in the cottage) in the later phases of the game. Once the board has been completely set up the player turns begin. Each turn has 4 phases and each phase is played for all players starting with the start player. In the first phase players select in which order the cottages send out their worker to the fields (only one worker is allowed per field), in the second phase players collect the resources their workers produced on their fields (each worker/field combination produces one resource) and in the third phase players can spend their resources. In the fourth and final phase the return to their homes and the next round begins. The right to determine the start player of the new round is up for auction - a game concept already known from Keytown. The player left to the current start player calls out how many resources he wants to spend to get this right followed by the other players who have to increase if they want to bid. The current start player is the last to bid and for him it suffices to match the current bid. In order to win the game, players must collect victory points. These victory points are stored on a second board showing the interior of the cathedral. Here we see 17 tokens, four each in the lower three rows providing 1, 2 and 3 VPs, then a row of three tokens with 4 VPs and two 5 VP tokens in the top row. When the game starts only the lowest row of tokens is placed face up showing the required resources to buy each of them. Once a row becomes empty the prices for the next row of tokens are revealed. Obviously, the number and value of resources required to buy a token increases with its VP value. In fact, only row's 1 and 2 tokens can be bought with resources alone while the higher valued tokens require goods like glass or even gold. All these acquisitions happen in phase three of a turn when players in sequence decide what they want to do. The buy options are to acquire a VP token with available resources or goods or to trade resources for goods. Other options are to convert a cottage to a house (a house can send out two instead of one worker), build a fence to prevent workers from other cottages/houses to work on a resource tile, or to demolish a fence. All of these build options cost resources, too. Finally, besides passing, a player may buy one of the two face down "influential law" action card that are available per round. Doing so ends phase 3 of that player. Influential law cards provide a one time special ability when used. Once all players have passed phase 3 of the current round ends. It's obvious that you need to place your cottages in such a way that you have access to all five resources. Since there will be times when the choices for worker placement are rather restricted it is a good idea to have at least 2 cottages bordering each resource type. Especially timber and stone are important resources as they are required for house and fence building therefore you need to make sure that you have safe access to both. Here you should consider that the fields next to the cathedral have one cottage less to compete with. Also take into account the seating order and the cottage numbers bordering a tile: never place a cottage next to a tile which has already an equally numbered cottage of the player to your right next to it. It's also a good idea to have at least timber or stone as a safe field which can only be accessed by you. Build your houses as soon as possible to make the best use of them. Remember that the game will last for only six to eight rounds. Houses can act as a sort of deterrent to other players preventing them from building a house in close vicinity to yours. It's often not worthwhile to build more than three houses as competition usually is very fierce on the board. You need to constantly watch the board to determine you "safe" fields as opposed to the fields where you are competing with possibly several other players. If possible make sure that you select a cottage number which provides you access to one of the most competed fields. Once the 4 VP tokens are turned over you are bound to need gold and/or glass. So it's a good idea to trade these already a round in advance so that you can grab the cheapest VP token in that 4 VP row. There's of course a risk here as you do not know for sure which goods will the required but going for gold with a safe income of timber, stone and water in the next round will almost certainly get you that 4 VP token. Make sure that the start player position is favourable, too. Being the start player is quite nice but sitting one or two positions left of him in a four or five player game doesn't really do any harm either. It's obviously not a good idea to sit right to the start player as this will severely limit your options in this round. There's a total of 46 VPs in the game so anything above 12 VPs usually means sure victory in a four or five player game. I believe that it is a good strategy to go for the low valued VP tokens and then prepare to grab either a 4 VP or 5 VP token to get those 12 or 13 VPs in total. But watch out what the other players are doing! If they follow that same strategy you may want to consider going for two 4VP and one 5VP token instead.